As a Macbook Pro user, I decided to do a wallpaper in honor of Steve Jobs. I’m not a fanboy or very dramatic about his dead, but I liked this idea of having the shape of his head in the missing part of Apple’s logo. After all, now he really is the missing part of the "apple". I keep it with a simple design, just like Steve liked. I swear by everything I believe that I didn't copy or steal any ideia. I never copied anything and I never will. During my life as a digital artist, I had to face many copies of my artwork, it would be a complete non-sense if I decided to copy someone. There's no way to prove it, but this was completely my idea. A fine tibute and thoughtful design!......well conceived. I just watched a documentary on Steve Jobs, the guy who came up with this logo was asian! No, the first person to came up with this concept was Chris Thornley. The "asian" Jonathan Mak then had the same idea an then I had the same idea. All of us had the same concept at different times without knowing that someone already did it before. Next time read the description and the top comments before saying anything. Sorry, but you really have some research to do. I don't wish anything bad for him, but I'm glad to see that justice exists. original idea by myself..hope u all like..
Woooooww! Well great minds think alike I guess. I really want to congratulate with you for your formidable and I'd love to underline Genius idea you where come out with! I also would love to suggest you to send your work to Apple I'm pretty sure they will appreciate to use it for future commemorations! My compliments again! Isto não foi tirado de lado nenhum, fui eu que fiz a partir da minha própria cabeça. Na altura que fiz ainda não era famosa a imagem do Jonathan Mak e eu nem sequer sabia que existia. Não tenho culpa que ele e outro designer antes dele tenham tido a mesma ideia antes de mim. ... well what matters is the intenton of the work, so we are glad for it. Oh, so you were the one who thought of this! Spectacular idea, man. Brilliant. Steve Jobs will be missed. I think this is the best. It may seem like so little but it says so, so much. Very well done. wow. this is spectacular! Genius idea. just like how I do not have any proof to prove you guilty, you do not have any proof to prove your innocence. However, I can say that your "style", based on your pre-existing dA gallery works, is very much(too much so) different to your deviation here. Deny all you like, but you still have no proof, and the odds really are against you. This is a stunning idea and a good graphics artist was bound to come up with it. It's just that many did so at the same time. Get out. "just like how I do not have any proof to prove you guilty"
If you don't have proof you can't acuse someone. the link is the real design hat was made in memory for Steve Jobs; a teenager of 19 from Hong Kong. He also did make Steve's profile in proportion to the "byte" of the original apple logo, making it far superior to the other versions of his idea. I certainly would not call the mentioned a "copy of [your] artwork." I NEVER said that Jonathan Mak copied my artwork. I just said I didn't copied his. 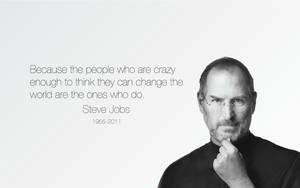 We miss you, Steve Jobs! Eaí cara, que bom que tu é br . Então, comecei a fazer wallpaper agora e queria saber como eu ponho tamanhos diferentes do wallpaper em zip direto no botão Download Image do Devian ali. E como eu separo ele da apresentação. Great work inspired by a great man. Good job BK1LL3R. That is strong man. I couldn't even come up with that. However, his is the best out of all the designs; who came up first with the idea does not matter.